Businesses are making $6.50 for every $1 spent on influencer marketing, according to a poll of marketing professionals conducted by Tomoson. The poll also found that marketers rate influencer marketing as their fastest-growing online customer-acquisition channel, outpacing organic search and email marketing. 59% of marketers are planning to increase their influencer marketing budgets over the next 12 months, the study found. Just 21% plan to reduce this spending or keep it the same, and the rest are undecided. Influencer marketing was rated as the fastest-growing online customer-acquisition channel, beating organic search, paid search and email marketing. Affiliate marketing performed worst in this category, with just 5% of businesses counting it as their fastest-growing channel. Influencer marketing and email tied for first place when marketers were asked for their most cost-effective online customer-acquisition channel, narrowly beating organic search. Affiliate marketing performed worst here too, rated the most cost-effective channel by just 2% of marketers. 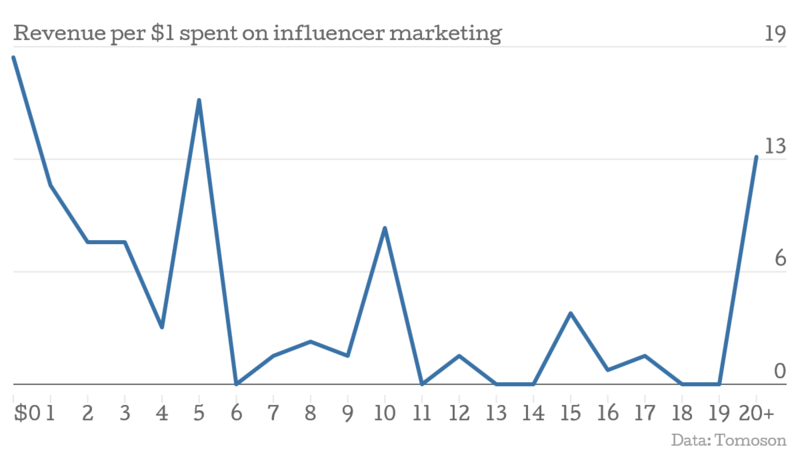 Businesses are making $6.50 for each $1 spent on influencer marketing, with the top 13% earning $20 or more. A resounding 70% are earning $2 or more, with the rest either breaking even or failing to generate a return on investment. 51% of marketers believe they acquire better customers through influencer marketing, when asked to rate the average quality of customers acquired through the channel. 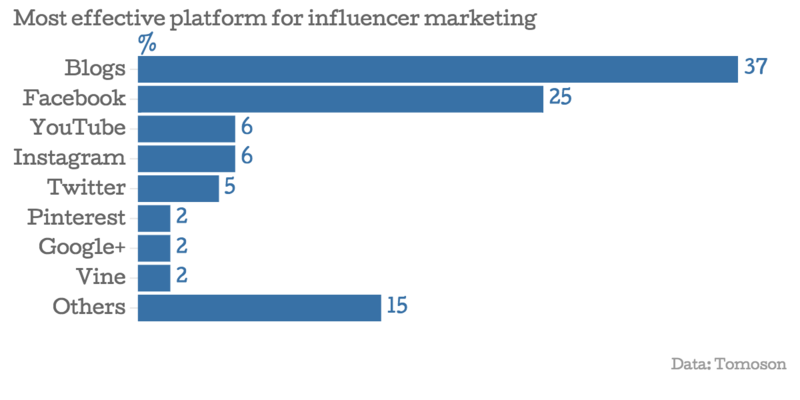 When asked about the most effective platform for influencer marketing, 37% chose blogs. Facebook was next, with 25%, making it the most popular social network. YouTube, Instagram and Twitter each got 5–6%, failing to collectively add up to the power of Facebook. 50% of marketers use influencer marketing to generate leads and drive sales, and 40% are focused on brand engagement. The remainder are focused on content promotion or other activities. Marketers consider sales figures to be the most important influencer marketing metric, selected by 56% of participants. Clicks and social shares are still favored by some, and earned media value was the least popular. Tomoson surveyed 125 marketers online from 10–16 March 2015. All percentages are rounded to the nearest whole number, and therefore certain figures may not add up to 100% exactly.